Have you discovered a honeybee swarm? We can help! We will be on our toes to come remove it from the property and relocate it to a beekeeper’s hive. Wild swarms have a better chance of survival under a beekeeper’s care. honey bee Swarm season has started! Check out the pictures of what a swarm looks like, it will be in a cluster. when swarm season starts, if you see bees that look like this, send us a message (kba-swarm-call@googlegroups.com) and we will respond immediately. kba only handles honey bees. Have you discovered a honeybee swarm? We can help! We will be on our toes to come remove it from the property and relocate it to a beekeeper’s hive. Wild swarms have a better chance of survival under a beekeeper’s care. Please look at the pictures below to determine whether it truly is a honey bee swarm and not some other type of bee. First of all, don't panic. 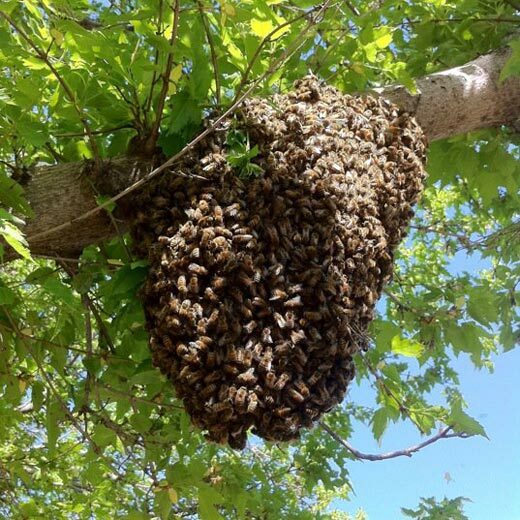 A swarm of honey bees hanging in a cluster will not hurt you. Swarms are not aggressive because they have no hive (comb with brood) to defend in this state. Swarms occur almost anywhere and are meeting & resting sites while the bees migrate to their new home. Swarms may stay on a swarming site for as little as 15 minutes or for several days or more. So when you see a swarm, keep in mind that they will not be on that site permanently. Swarms occur most often in mid to late Spring (April-June) and less frequent during the Summer. Please don't call an exterminator or a pest control service! They will only kill the bees! A KBA beekeeper will be more than happy to remove the swarm free of charge. Simply click the contact button. KBA will only retrieve HONEY BEE swarms, we do not specialize in any other type of bee. Please use the identification guide to determine if you have honey bees. The best option to get a swarm removed quickly is to email us at one of the contact buttons above. Whomever is closest to your area and available will respond to the email quickly by calling you, so please leave a number in the email. However, if you are unavailable to email and have an urgent situation, you can contact one of our below members directly by the closest part of town where the swarm is located. Please remember we ONLY handle honeybees, we don’t consult on or remove any other type of bee. If the honeybees are inside a structure, please read the “Feral Bee Hive Removal” portion of this page below. The KBA Swarm team does not do cut-outs and trap-outs, we do honeybee swarms only. 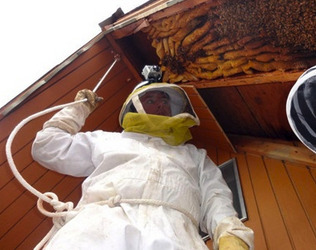 Honeybees removal from structures require a lot of labor, so please email about those and we can see if a KBA member is available to do the work. If a swarm of bees has established a home of comb in an unwanted location, such as inside a tree on your property, inside a structure's chimney, or within the walls or eaves of your home, the bees can be removed in a process called trapping or cut-out removal. Please be advised that removing bees in this manner can involve disassembling parts of your home or building. Make sure you have a clear understanding with your beekeeper about the complete process and who will be responsible for what will happen from beginning to end of the entire project. A fee is usually paid to the beekeeper for this type of removal because of the amount of time and labor involved. We do not recommended spraying hives in buildings or homes with insecticide; not only are beneficial pollinators killed, but the honey, wax and dead bees will remain in the wall and attract all-kinds of bugs and rodents including mice, roaches, moths, beetles and yellow-jackets. The best course is to remove the hive in its entirety. 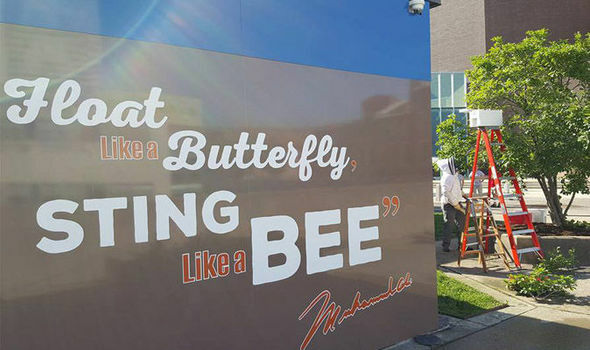 The Kentuckiana Beekeepers Association (KBA) helps connect honey bee related requests with member beekeepers as a volunteer service to the community. The KBA makes no claims to the level of experience or skill that a member beekeeper may have in either swarm rescue or colony removal. 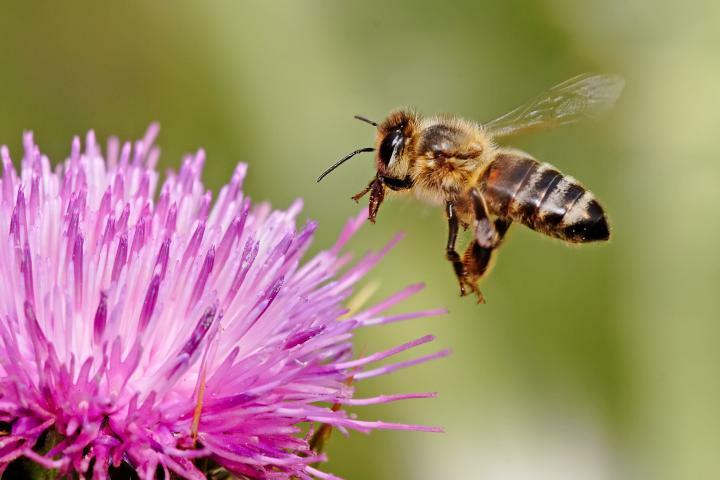 It is the responsibility of the person requesting service, and the member beekeeper, to determine what service will be provided, if it is pro bono (free) or if the member beekeeper charges a fee.